^ Proctor, N.S. and P.J. Lynch (1993). Manual of ornithology: avian structure and function. Yale Univ. Press, New Haven. ^ a b Lucas, Alfred M. (1972). 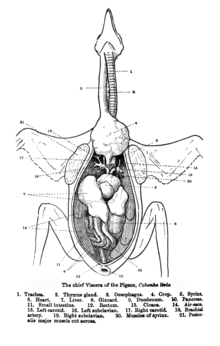 Avian Anatomy - integument. 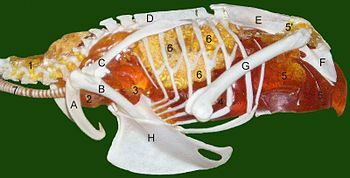 East Lansing, Michigan, USA: USDA Avian Anatomy Project, Michigan State University. pp. 67, 344, 394–601. ^ Piersma, Theunis; Renee van Aelst, Karin Kurk, Herman Berkhoudt and Leo R. M. Maas (1998). 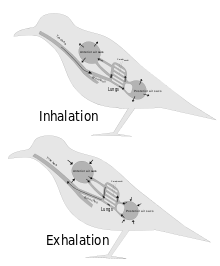 “A New Pressure Sensory Mechanism for Prey Detection in Birds: The Use of Principles of Seabed Dynamics?”. Proceedings: Biological Sciences 265 (1404): 1377–1383. 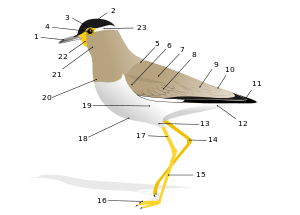 doi:10.1098/rspb.1998.0445. ^ Zusi, R L (1984). “A Functional and Evolutionary Analysis of Rhynchokinesis in Birds.”. Smithsonian Contributions to Zoology 395. http://hdl.handle.net/10088/5187. ^ June Osborne (1998). The Ruby-Throated Hummingbird. University of Texas Press. p. 14. ISBN 0-292-76047-7. ^ Lake, PE (1981). “Male genital organs”. In King AS, McLelland J. Form and function in birds. 2. New York: Academic. pp. 1–61.